The marketing industry is choc-full of stereotypes. The boozy 50-something agency board member who contributes little but has a contacts book to kill for. The ambitious 23 year old account handler who will do whatever it takes to claw and clamber his way to the top. The young, blonde secretary with a surprisingly large collection of designer handbags, courtesy of her much older boyfriend. The production guy who has been in the same role at the same desk for fifteen years and has no intention of rocking the boat. The client who sees their agency as his or her personal entertainment, concierge and gifting service. The other client who got promoted into a role they can’t handle and are relying on the agency to pick up the slack and make them look good. To be honest, you’ll find most of these characters in the horse world too – just check the pages of the Stable Stereotypes book. But I think the book missed one equestrian sub-group and I’ve christened them the Empire Gals. In another age, these ladies would have been helping their husbands ensure that some far flung outpost of the British Empire ran smoothly, aided by a fag in one hand and a G&T in the other. Or alternatively possibly a Headmistress in a 1950’s boarding school. 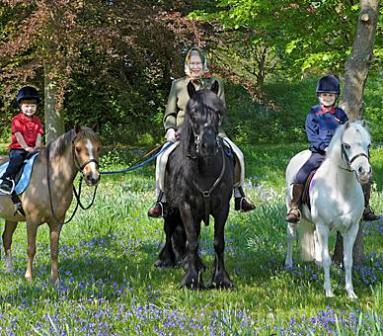 In fact, judging by this photo of HM The Queen and her grandchildren released this week to mark the Royal Windsor Horse Show, she’s an Empire Gal too. Her Majesty maintains a full schedule of public duties, is apparently not averse to the odd gin and dubonnet and hasn’t given up riding at the age of 85. Go, Ma’am.